Annual return –v– Annual accounts. Don’t get them twisted! We often get clients turning up in a panic asking for help because their annual accounts are due in a matter of days. When they produce the letter from Companies House it turns out that it’s actually the annual return that’s due and not the accounts. It’s important therefore to realise the difference between the annual return and the annual accounts. The annual return is basically a quick snapshot describing the state of the company and its directors at the end of a year. It asks for general information on the directors, i.e. their names and addresses, and where there’s a company secretary it asks for similar information. Other requested information includes the registered office address, details about the shareholders and the company’s share capital. There is no technical knowledge required to complete the return, it’s more a case of being thorough and logical. The annual accounts are what most clients are more familiar with. Typically the accounts of a small company will comprise a director’s report, profit and loss account, balance sheet signed by a director and notes to the accounts. The profit and loss account describes what the company did during the year. How much money it pulled in, how much it spent, what did it spend it on, did it come out ahead, i.e. make a profit or come out behind and make a loss. The balance sheet gives a static picture of the position of the company at the year end date. What are its assets, its liabilities, how much is the company owed, how much does the company owe. How large are its reserves and so forth. This is typically where the directors will hire an accountant as there are specific rules on the valuation of assets and liabilities and on the reporting of income and expenditure. So there you have it. 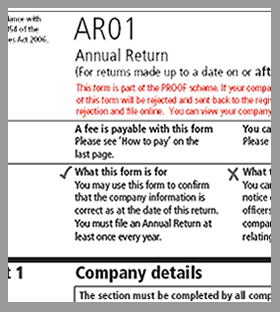 The next time you get a demand from Companies House for your annual return there’s no need to panic, just fill in the information as required. Of course if you really can’t be doing with all that form filling then give Joy & Co a call and we’ll gladly take it off your hands.